Rainfall in the Pacific Northwest takes an annual break during our summers when days are longest and hottest and evaporation far exceeds anything that falls from the sky. 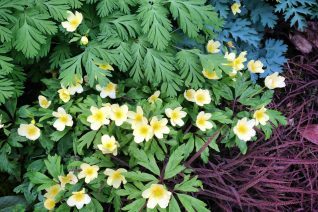 It makes sense to seek out plants that are adapted to dry summer conditions. A large selection of these plants are from the Mediterranean or are natives of the West Coast. Most importantly, these plants save water and money without sacrificing good looks. And many drought adapted plants actually shun summer water. Its wise to group these plants together and designate a no water zone. You’ll be amazed at what a beautiful vibrant garden you can have without irrigation. Find the right plants and then trust their built in adaptation- its a simple and smart way to garden. And it saves resources- as well as the gardeners precious time. We’ve grown a lot of Aloes with purported cold and wet hardiness and this is the one that has been the most successful. A large succulent shrubby plant with rosettes of deep green succulent foliage. 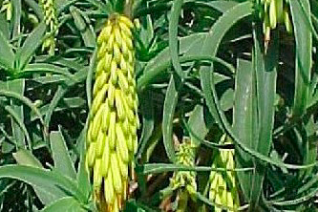 In late summer to autumn a showy display of large yellow flower spikes can occur. Very pretty and loved by all nectar seeking folks. 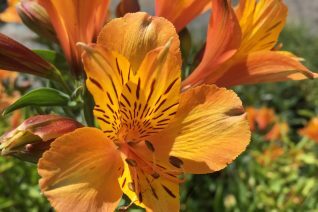 Give this South African perennial VERY GOOD DRAINAGE in full sun and a warm position. A slope is always helpful. Amend the soil with plenty of gravel and sand as well as compost- these guys do need to eat- so a little handful of organic fertilizer is recommended. Capable of freezing to the ground (below 15ºF) and resprouting from the base when truly warm weather arrives. Plant on a south or west facing slope preferably against a warm wall or boulder for added reflected heat. Easy, if large, container plant that you should protect from temperatures in the teens. To 3′ x 3′ on average in our climate. Mostly evergreen here. Combine with Agave, Cactus which will also increase their growth rate if you provide light, consistent water during hot weather. A good Alstro is hard to find. The dwarf varieties are ever plagued by snails/slugs, Many of the most exquisite varieties (patented) are poor garden performers, lacking vigor or something. Enter this most fave cultivar. First of all its orange and many will confuse it with the more diminutively flowering A. aurantiacus which can become an ineradicable weed. THIS IS NOT THAT. 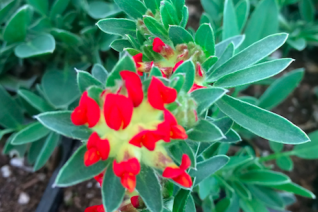 Its a polite clumper with enough vigor to send up fully 30″ flowering stems repeatedly for up to 6 weeks in summer. Speaking of which the individual flower will last up to two weeks in a vase. Do not cut them (which injures the plant – it bleeds out) rather gently rock the base of the stem back and forth to detach. This will help and not hurt it. Regular summer irrigation in rich, moisture retentive soil. Winter deciduous. To 2′ wide..
Threadleaf Bluestar is a fantastic native North American perennial with many seasons of interest. 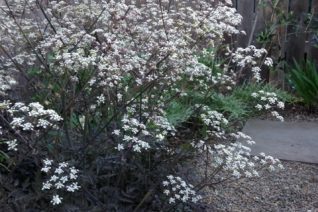 To 4′ tall this strongly clump-forming perennial has thread-like green leaves that line the sturdy, very vertical stems. 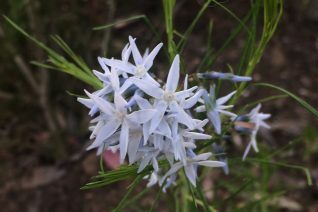 Upon rising in late spring they host clusters of star shaped, fragrant (yep) blue flowers. Very pretty. The green, fine-textured foliage holds space as a blowsy presence in borders, gravel gardens, hellstrips. In autumn the entire plant turns shocking yellow and stays that way for weeks. Fall color at ground level and it rocks. Light but consistent summer water to aid in establishment. Very drought tolerant then. Full sun in any soil type but for permanently boggy. Good deer resistance. They will try it once but not again- for what it’s worth. Completely deciduous in winter. Emerges mid-spring. Very long lived, no-fuss perennial. Mix with ornamental grasses, cacti, just about anything. Alkanet, Italian Bugloss- neither name is very appealing but I’m here to testify that if you are a connoisseur of the color blue this big showy perennial is for you. To 4′ tall multiple spikes bear rich, deep, true blue flowers in one bodacious cloud. 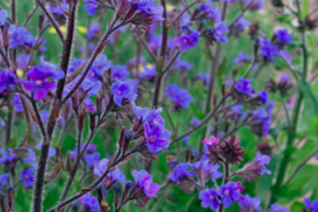 This form is not only a superior blue, but its a more reliable perennial. Most live 2-3 years but this often persists for longer. This borage forms a basal rosette of rough leaves- this is important to identify the inevitable seedlings- they are dark, dark green and spiny. Blooms first year from seed. A Spectacular plant for a young garden, a dry garden, wild border or in its most classic home the cottage garden. Full sun and average to enriched soil that drains quickly. Light consistent water to establish then drought adapted. Long, long blooming plant that often has bumble bees fast asleep in the cup shaped flowers. Very cool. Obvious pollinator gem. Very climate adapted plant. 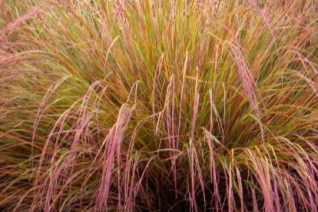 Pheasant Tail Grass is a clumping large arching grass with colorful surprises throughout the year. To 30″ tall and a little wider the army green arching foliage takes on dramatic orange and red tints if given just a little stress. In summer fine tawny orange/brown glossy seedheads arch gracefully within the foliage. Full sun to very light shade in rich, well drained soil with consistent summer moisture- a little dryness and wham! You get those fiery tints. Requires a protected location in gardens, avoid full on exposure and cold winds. Its best application though is as a large graceful container subject. And the drainage adds to cold hardiness. Remove seedheads before they mature as it does like to seed around. Mulch for arctic weather. Moderate deer resistance. New Zealand. 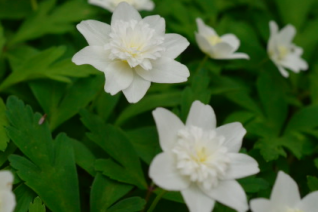 Excellently climate adapted, there are many forms of Anemone nemorosa but this is by far our favorite. Pure white flowers with a congested bunch of petals in the center. Natures pin cushion. Blooms late March to early May. Spreads to form large colonies in rich well-drained soil with ample irrigation. The whole plant goes completely dormant by summer, cleanly disappearing before you have time to notice it. Part shade to full sun. Not bothered by pests or animals. Even though it goes summer dormant it’s still beneficial for these plants to receive regular water. You’ll notice the difference the following spring. 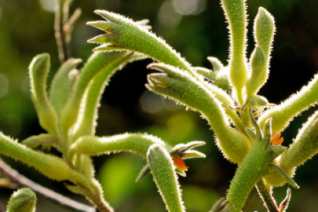 A customer of ours from the N. Oregon Coast (Gearhart) brought us divisions of the large, green-flowered Kangaroo Paw species. It had thrived in her garden there for 20 years and formed a huge patch. She had divisions aplenty. We’ve since found that it isn’t quite hardy inland but it’s still a durable, cool, long-blooming plant. Easy container plant that you can protect if the temperature threatens to drop below 20ºF. 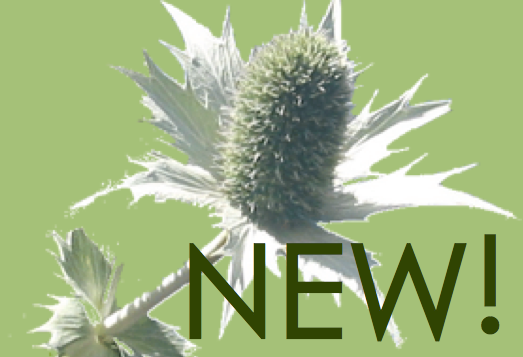 In summer they send up 4′ spikes with their green, curiously fuzzy paw-shaped flowers. They remain in bloom for weeks. Full sun and fertile well-drained soil with regular water. Easy to divide. Multiples quickly.